There are many ways to make fresh cheeses like Tvorog, and they’re called by many names from different cultures. Known as Quark, Farmer’s Cheese, White Cheese, Fresh Cheese and many more names. I grew up eating Tvorog stuffed in blini or Vareniki, or ate them as fried Syrniki. We went to Russian school every Wednesday night, Mum would get fresh raw milk from a member of the local Russian church who had some cows, to make the Tvorog. We were buying bootleg milk literally from the back of his van! There’s lots of debate around raw milk and the flavours and health benefits/dangers it brings, all I remember is how great this cheese was. Use the leftover whey when making pancakes or crepes, bread, or other baked goods. I put the whey into a glass jar and keep it in the fridge till I’m ready to use it. Tvorog is not hard to make, and there are several ways of making it. There is a quick method involving lemon juice and milk brought to a quick boil, which you can find here How to Cheat and Make Quick & Easy Farmer’s Cheese Tvorog (творог) but in this recipe, I’m hoping to keep the live cultures, well… alive. This method takes longer but hopefully will have some health benefits from probiotics too. When you heat the soured milk, you want to keep the milk temperature no higher (maximum) than 130°F/55°C, otherwise the probiotics won’t survive. I used a preheated convection oven, and monitored the temperature of my soured milk. Higher temperature won’t affect the Tvorog, only the probiotics. Most Tvorog recipes will use buttermilk or sour cream instead of Greek Yogurt, but I find that Greek Yogurt gives a milder taste to the tvorog and it works great. It’s important to use natural plain Greek yogurt, without any sweeteners or additives, even thickeners and gelatine. If you have never had Tvorog, you’ll either love it or hate it. It’s not really like ricotta or cottage cheese, as it is more sharp and sour. It’s a soured fermented milk product! Just be careful when pouring the mixture into the colander. 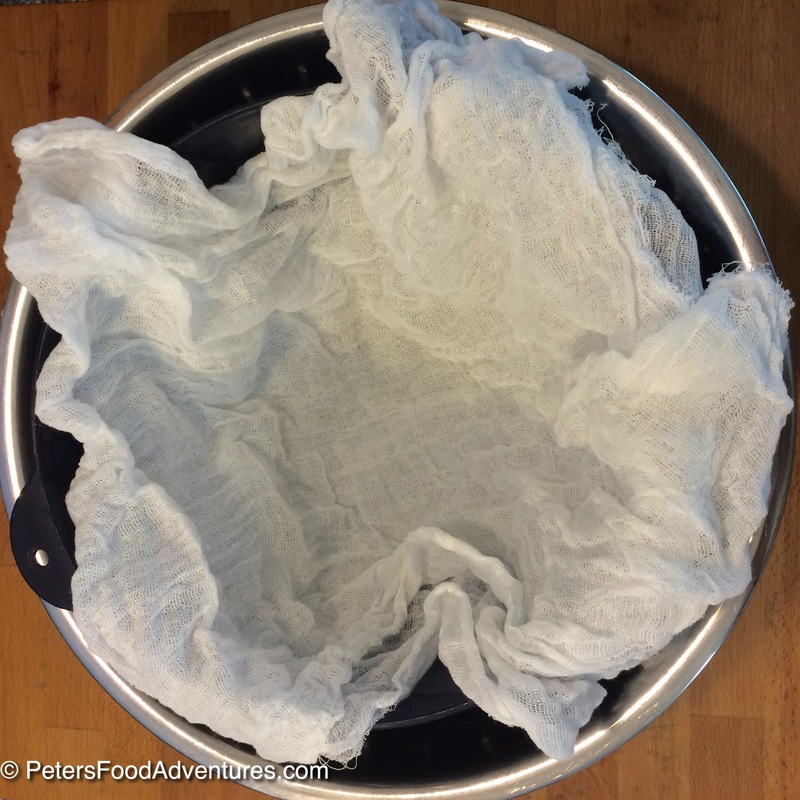 My cheesecloth fell into the wet tvorog and I had to re-strain it all! It was a painful experience, so find a helper at this stage if someone is available! Tvorog is part of the acid-set cheese group, meaning no rennet is added to the cheese. It’s pretty cool to say that you’ve made your own cheese and you know the process, and what went into it. I’ll probably save some tvorog for Syrniki, and eat the rest with sour cream and berries or jam. Bon Appetit! Приятного аппетита! Put the milk into a large pot with a lid. In a separate bowl, add the Greek yogurt and some milk and mix together to remove lumps. Add the yogurt mixture to the pot and stir. Put the lid on the pot, but leave the vent open if available. Leave in a warm spot, on the kitchen counter/stove for 2-3 days or more (depending on temperature in your house). The liquid will start to thicken and give off a slightly sour smell. It will look more yogurt-y with curd formations in it, but look nothing like tvorog at this stage yet. Turn the oven to preheat to 120°C/250°F. Put the pot into the oven for 1 hour to gently heat the milk. Check the temperature of the milk to keep it to 130°F/55°C. When you take it out of the oven, you will see curds separating from the whey. Do not turn temperature higher as it will kill any live cultures in the cheese. Allow to cool for about 45 minutes so you don't burn yourself. In a separate bowl, place a colander lined with cheesecloth ready for the tvorog mixture. Carefully pour the mixture into the lined colander. 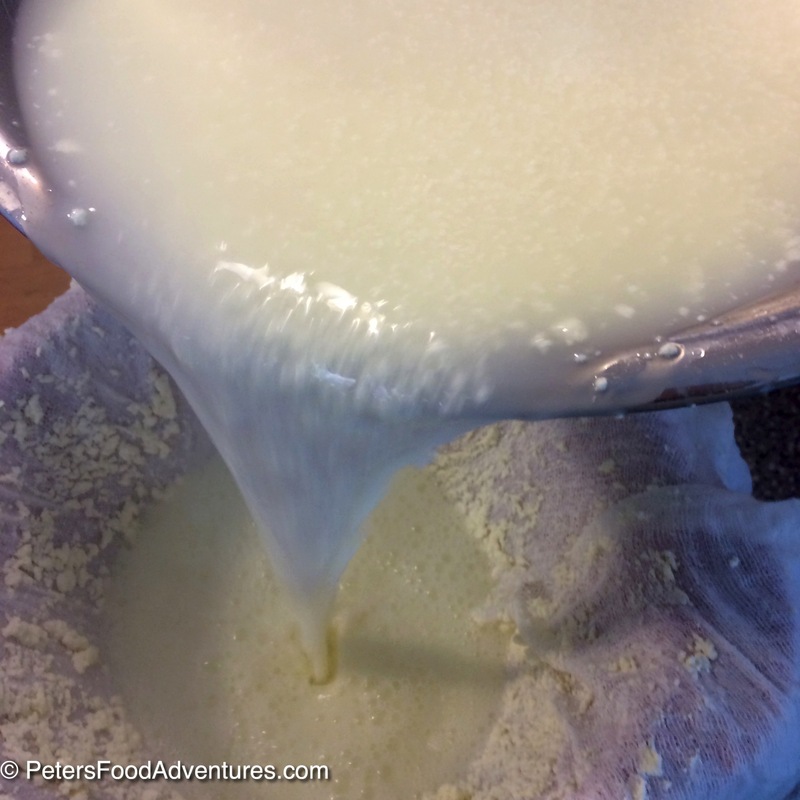 The curds stay in the muslin/cheesecloth and the whey in the bowl. Tie the muslin/cheesecloth into a knot to drain. Hang on a faucet over the sink, or on a kitchen cupboard handle with a bowl underneath, or in the colander in the fridge overnight. Reserve some whey in a glass jar and refrigerate for future use in breads or crepes. Untie the muslin/cheesecloth and enjoy your tvorog! Thanks for stopping by my blog and liking my post! My cousin owns a ‘share’ of a cow, I know exactly what you mean! Interesting concept! #keeptheprobioticsalive! I usually make the cheese with the milk and lemon juice also known as paneer and use the whey…will have to try this one…Are they similar in taste? I’m not sure, I’ve never had paneer, but I think around many cultures there are similar recipes, and I’m assuming they would taste very similar! 🙂 Tvorog isn’t formed into solid pieces, we use it crumbly only. I’ll keep my eye out for paneer and try it! Use of bacteria instead of acids as lemon juice or vinegar has many benefits such as bacteria will eat lactose and transform casein protein in milk, what makes it healthier product which is better tolerated by people with dairy sensitivities. Thanks for sharing! I love the way it’s made to keep the probiotics alive, as I usually just heat it on the stove, almost boiling it! Can’t wait to try this healthier way! I can’t wait till its done! I’ve got it started right now on my stove. It’s much easier than how babushka made it. Thanks for sharing this wonderful recipe. 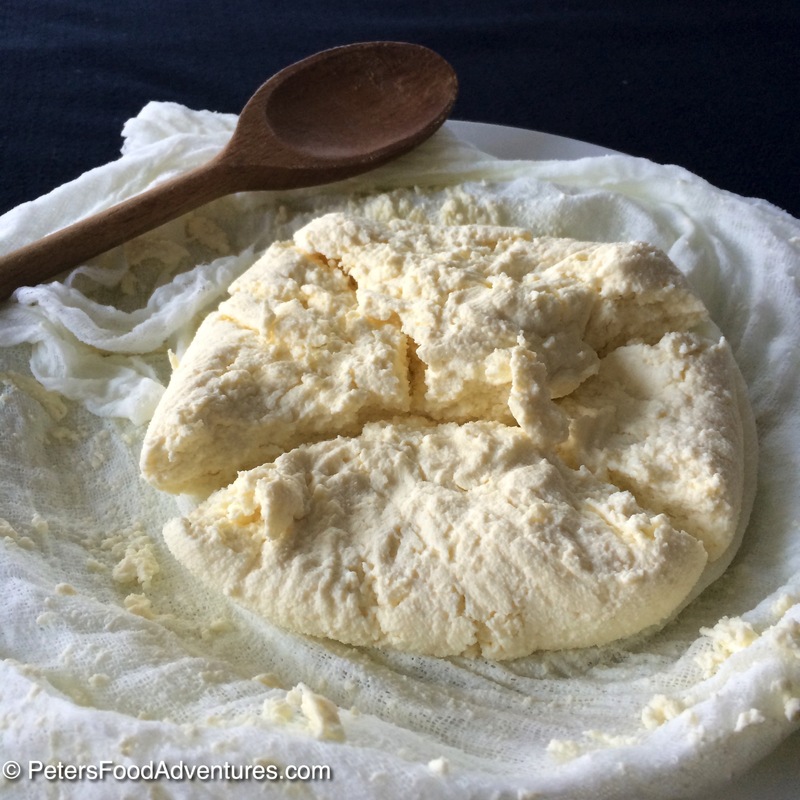 I’ve always wanted to try making fresh cheese….this sounds interesting indeed!! Thanks for the encouragement! 1. Is there any way to remove this popup from your pages? I have to keep scrolling to read or else keep refreshing the page: ENJOY THIS BLOG? PLEASE SPREAD THE WORD 🙂 What do the numbers mean? 2. In making your tvorog from Greek yogurt (which as I understand is just yogurt that has been drained, but not as much as Labna), you mention taking it up to 130ºF. I’ve been making thermophilic yogurt for many years and all the recipes that I’ve seen say to not let it get above 110-112ºF after the culture is added. Aren’t your bacteria killed at the 130ºF of your oven when making tvorog, making it non-probiotic? Hi Pugo, thanks for checking out my blog and recipe. The pop up should only pop up once, and you can close it by clicking on the X in the top right corner just above the 🙂 of the pop up. The numbers show the number of followers via the specific social media directly above it. With regards to the temperature, 110 degrees will absolutely work, and it’s my understanding that the bacteria will not die at 130 degrees. You don’t want to heat higher than 130 degrees, as that will kill the culture. it’s absolutely ok to go 110 degrees, which gives the person making the cheese more lee-way in case of over heating accidents.